Display is 14 digits, amber Panaplex gas discharge. 4-functions, with fixed decimal point - set by entering the required number and pressing the "DS" (Decimal Set) key. Main integrated circuits are marked AMI (American Microsystems Inc.) and Burroughs. 245 x 285 x 98 mm. / 9.6" x 11.2" x 3.9". The label is missing from this machine, but it was probably made at the Burroughs factory in France, since there is writing in French etched into the main circuit board. The main circuit board has the date "21 DEC 1972" etched on it, and date codes on the integrated circuits are from late-1973 and early 1974. With the cover removed showing the Panaplex display, the display driver board, and keyboard. The Panaplex display was developed by Burroughs from its Nixie tubes. This is the first type of Panaplex and was replaced by the popular Panaplex II. Note that the display is heavily filtered red when the cover is in place (see photograph above). 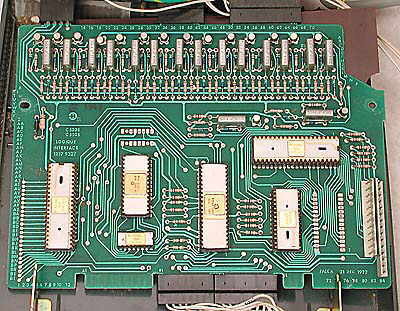 The logic board, showing integrated circuits marked AMI (American Microsystems Inc.) and Burroughs. 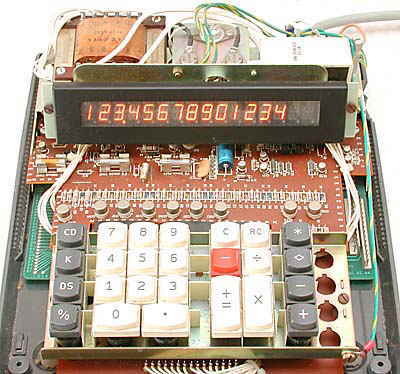 By the date of manufacture it was unusual to use so many large integrated circuits for a simple 4-function calculator. 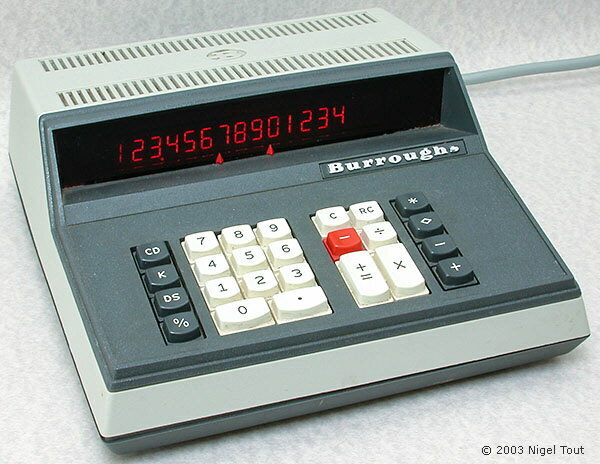 The Burroughs company of Detroit, U.S.A., had been very successful as a manufacturer of mechanical adding machines and accounting machines, and was an early entrant in the electronic computer industry. In the electronic calculator field it is best known for inventing the "Nixie" numerical display tube and its successor the Panaplex display, as used in this calculator (see Calculator displays for more information). The company produced a range of desktop electronic calculators in the late 1960s and early 1970s, many at a new factory in France. The calculators appear to have been dropped from its product lines in the mid to late 1970s, and in 1986 Burroughs Corporation and Sperry Corporation merged to form Unisys Corporation.